No pictures today and only a little video. Hideous downbursts of rain should have ruined the ride, but the 990 Adventure and I have the groove on. That’s largely owing to a new rear tire, a complete lack of enforcement from Whitehorse to Dawson in the Yukon Territories, and the good graces of Jim from Tourism Yukon who’s offered to carry the luggage in a support vehicle. So much for going “solo”, but damn the bike feels so good I couldn’t give a toss. Adventure purists can keep the weighty luggage, spare gas cans, and tents, because the big KTM is absolutely singing as it runs light and fast over rough pavement, stretches of gravel, and construction zones measured in kilometers. 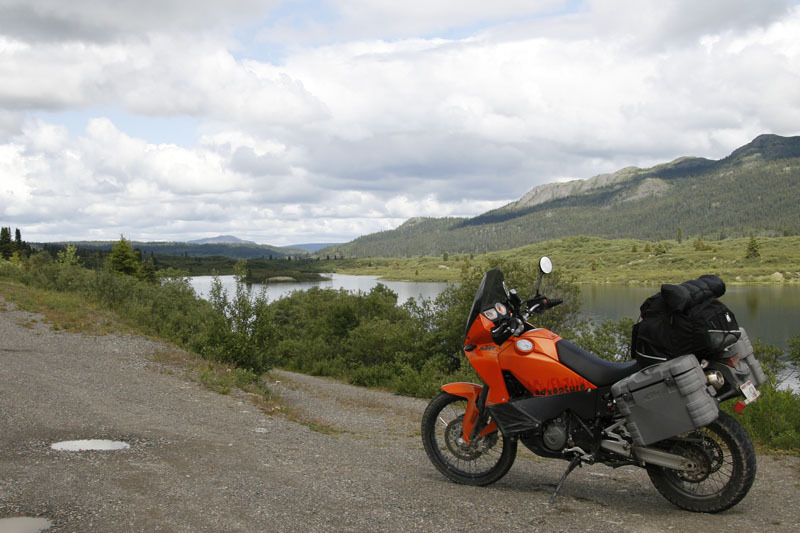 We’re a flash of orange skimming the “marge of Lake LaBarge “ 40km outside Whitehorse. We’ll have to catch up on the historic tourism on the way back south, because Robert Service never encountered corruption like this. The bike is alive in a way it’s never been under the burden of luggage, and that’s created some outlaw spirit. There’s a stretch of gravel ahead, I ease off the throttle, stand up, then begin feed the twin some gas. The Keihin fuel injection system feels jerky and harsh at low speeds, but glancing down at the speedo I find it’s feeling just right at 110. Actually it feels better a bit faster. SUV’s and trucks pulling fifth-wheels are dispatched with ease even on the gravel. Despite the 990 label, this is a big 999cc adrenaline pump, and I’m feeling fully hooked up. Transitioning to pavement again and through the twists we pick up the pace again. Every vehicle seems to have a natural set point, a place where it feels best, and the 990 Adventure seems to live at 140. That’s not hugely fast, but we’re running on roads that are wallowed, frost-heaved and, at points, outright wet. That’s enough to make most bikes squirm a bit. Then throw in the temperature. It was 8C in Whitehorse this morning when I set out, and has dipped to 5C at times… before factoring in throttle induced wind-chill. I’m not ready for the warmth of cremation, but I’d surely like some rain pants. A brush against a hot exhaust a couple tests ago melted holes large enough to render mine useless and it seems I tossed them out of my stock pack of raingear. In Pelly Crossing I stop for another fill up. At the till the rough-shaven gentleman displays the Yukon grace and hospitality that still catches me off guard. Digging out my rain jacket as I sip a fresh coffee I agree. The KTM Phase Jacket, a re-badged Thor is undoubtedly a well thought out enduro offering. The Phase is light, convertible to a vest, accommodates the Alpinestars Bionic Protection 2 Jacket underneath handily, and equipped with plenty of useful pockets. It would be great for a weekend or a week… some place dry. Unfortunately, this jacket has the water resistance of a sieve. Actually the sieve would be better it doesn’t hold water. The Phase once wet is content to stay that way. The Alpinestars Tech3 boots are fairing considerably better. Despite the ski-boot look, these off-road boots are surprisingly comfortable. They also keep the rain out. On the down side the plastic creations don’t breath so you tend to stew in your own juices. At this point in the ride the stench unleashed when taking my boots off is thermonuclear. The weather may not be stellar, but the cool dense air isn’t hurting the bike’s power, nor is a run of luck with the gas stations. It’s been premium all the way at Carmack and Stewart Crossing with some regular mixed in at Pelly Crossing between. That mean’s the Ka-Toom has been free of the filled gas cans, and the associated weight, all day. Given the frequency of the gas stops I’m not sure why I worried so much about my support team of “Jerry and Can”. Actually they might be needed, a final northern destination has wormed into my mind. Dawson City, Yukon is only 422km from the Arctic Circle marker on the tire eating Dempster Highway. I’m tempted to do something very stupid. Today’s ride left me wondering if I should store all the gear in Dawson and run light latitude 66° 33’ 39” North? Maybe less weight would reduce my risk of a puncture? First, it’s off to the Dawson City Music Festival, a happy coincidence of destination, to which I’ve been invited to along with a few other journos by Tourism Yukon. The stories of “DCMF” leaves me doubting I’ll be riding tomorrow, or even sober. Mind you, in the land of the midnight sun “tomorrow” is a pretty loose concept. With that in mind I switch out of my “civvies”, back into my already dirty riding gear, and head out into the muddy streets of Dawson. No sense in getting the clean clothes muddy.